As a native Hawaiian cultural practitioner, spiritual guide, life guide, and author, Kahu Wendell Kalanikapuaenui Silva has touched the hearts and souls of many people throughout the islands with the sharing of his traditional knowledge and wisdom. 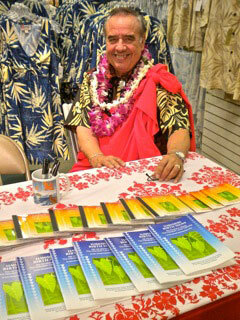 His latest book entitled, Hawaiian Birth Signs was officially launched with a book signing hosted in partnership with Hilo Hattie’s flagship store Nimitz Highway in Honolulu, Hawaii. Kahu’s Hawaiian Birth Signs is more than a book. It is a unique educational resource and spiritual guide to assist you as you embark on the journey of life. 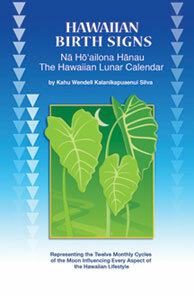 It offers a comprehensive compendium of astrological revelations based on the Hawaiian lunar calendar, and a legacy of ancient Hawaiian kahuna teachings designed to help you understand the nature of your true self, your earthly relationship to the universe and how you can use this valuable information as an insightful guide to making key life decisions associated with your family, relationships, career and more. Everyone interested in exploring the sacred realm of the Hawaiian spirit world, learning about ancient deities and little known cultural tidbits will also find this book extremely fascinating. A search on the internet will reveal no other expert information on this topic. There’s no need to wait for a birthday to give this as a gift. Hawaiian Birth Signs makes a unique and perfect anytime practical and inspirational guide for living for that special someone or anyone you love. In Hawaii, that means husband, wife, mother, father, son, daughter, sister, brother, grandma, grandpa, aunty, uncle, cousin, relative, friend, co-worker, boss, teacher, business associate and especially, expectant parents. It’s a gift that’s a timeless resource to be used over and over for many different reason. Published in a limited edition, Hawaiian Birth Signs is a companion to the audiobook (on CD) of the same title. Entertaining and culturally authentic, the audiobook treats listeners to a dramatic narrative which enhances the monthly musical highlights – mele (songs) and traditional oli (chants) performed in the kahiko (ancient) style by Kahu. Powerful calls of the pū kahea (conch shell) heralds each month and 5 traditional Hawaiian percussion instruments and 2 wind instruments are nature’s many voices: (drum), kala`au (dancing sticks), `ili`ili (stone castanets), `uli`uli (rattling feather gourd), ipu heke (double gourd), `ohe hano ihu (bamboo nose flute) and pū, (conch shell). Their instrumentation masterfully conveys the changing seasons, their natural manifestations – rain, storm, gusty wind – sacred representations of the powerful ancient Hawaiian gods. Students of hula will especially enjoy the mele and oli and the sounds of nature. Both products are currently available for purchase here or directly from the author at Hawaii Cultural Services, LLC. They are offered at retail and wholesale in low bulk quantities and are great for fundraising. To purchase and for more information about our diverse Hawaiian cultural services and products, please feel free to explore our website and use our contact form to email us. Mahalo a nui loa to Hilo Hattie’s Donald Kang (President/CEO), Eddie Kang (Sales Manager), Felix Calvo (Vice President of Operations) and friendly staff for sharing their aloha, genuine Hawaiian hospitality, support and the opportunity to launch our book and audiobook at Hilo Hattie. Thank you for efforts to showcase quality products made by Hawaii artisans. Hilo Hattie is word famous for it’s versatile line of island fashions for the entire family featuring tropical Hawaiian prints. Their newest upscale line of men’s and women’s wear by Hawaii fashion design icon Mamo Howell, is beautiful. Happy 50th Anniversary & Blessings for Continued Success to Hilo Hattie! Where can I find this book? Hawaiian astrology is so intriguing to me, and I know nothing about it. Would very much appreciate any guidance to locating some resources on this topic. Thank you for your interest. 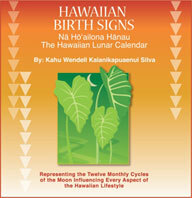 Our unique and limited edition book about Hawaiian birth signs based on the lunar calendar, may be purchased at this website shop www,kahunateachings.com or, if you use our site contact form to email your order, we give a discount.